WindEurope’s Working Groups are the brain of the trade association and shape policy to respond to the main challenges that your business faces. WindEurope experts draft policy recommendations based on first-hand input from the industry and have direct access to the institutions that design the EU regulatory framework of tomorrow. All members Leads WindEurope’s work and outreach on EU climate and energy policy with a view to promoting stable market and legislative frameworks. All members Leads the industry’s positioning on policy frameworks related to the design, operation and planning of power markets in the EU. All members Contributes to WindEurope’s work on shaping EU priorities on grid infrastructure developments and accompanying regulatory framework as well as all technical issues relating to wind power grid integration. All members Promotes European offshore wind energy as a vital and strategic energy resource by, among other priorities, investigating barriers to drive down costs and advocating for investments in offshore electricity networks. Premium Drives WindEurope’s work towards cost reductions in the wind industry and maintaining European technological leadership by ensuring optimal use of European research funds. All members Promotes tools that enhance the attractiveness of wind energy as an investment and closes the knowledge gap between the industry, the finance community and policy makers. Premium Provides vital input into the concept, timing and format of WindEurope’s events factoring in market dynamics. Premium Supports the wind industry’s communication activities including press relations, social media, political communication, events and campaigns. All members Promotes best practices in the wind industry and acts as a centralised coordination platform for other European Health & Safety organisations and associations. National associations Strategically coordinates the political and communication messages of the wind industry to ensure it speaks with a coordinated and common voice across Europe. WindEurope’s market intelligence team provides members with focused and valuable information on offshore and onshore wind in the 28 EU countries and neighbouring countries. Get easy access to market data, attend topical webinars and workshops, and receive the necessary intelligence to grow your business. All members A user-friendly online application to track the latest onshore and offshore wind industry statistics in terms of installations and grid connections. All members A summary of the most relevant developments in EU energy policy. LM & CorporationsPremium A quarterly publication providing detailed updates on support mechanisms, support level and duration of the support for both onshore and offshore wind in EU Member States. LM & CorporationsPremium A quarterly publication tracking wind turbine orders across the EU and offering a clear, concise overview of EU market trends, analysis of market shares and regional market opportunities. All members WindEurope’s monthly newsletter featuring the latest news on EU energy policy dossiers, the latest deals and transactions in the industry as well as WindEurope’s activities and achievements. All members Speakers’ presentations, full papers and session recordings. A comprehensive library of all proceedings from WindEurope conferences and technology workshops is accessible from the WindEurope Members’ Area. WindEurope is the world’s largest wind energy network, gathering the most important businesses and decision makers in the wind industry. All members A 30% discount on all conference delegate, exhibitor and visitor passes at WindEurope Annual and Offshore Conferences & Exhibitions as well as at Technology Workshops. All members A personal invitation to the WindEurope Annual Members’ Reception and other VIP events reserved to WindEurope members only. Working groups Beyond learning about and shaping policy recommendations, Working Groups offer great opportunities for sharing best practices and experiences. All members A direct access to the contact details of wind energy professionals from the 500+ members of WindEurope. 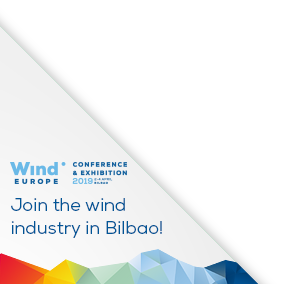 Having your organisation listed on the WindEurope website gives a clear indication of your belonging to the wind energy community and promotes your company’s products and services. All members Increase brand visibility exhibiting at any of WindEurope’s Annual or Offshore exhibitions. Members benefit from a 30% discount on booth prices. Premium Get priority access to speaking opportunities or become a member of Conference Programme Committees that shape the content of WindEurope Conferences. All members Benefit from visibility on WindEurope’s different communication channels. Premium In addition to holding a Press conference at WindEurope’s Annual and Offshore conferences and exhibitions, get priority access to press trips coordinated by WindEurope, including visits to your factory and other facilities. Commercial Manager, MPI Offshore B.V.